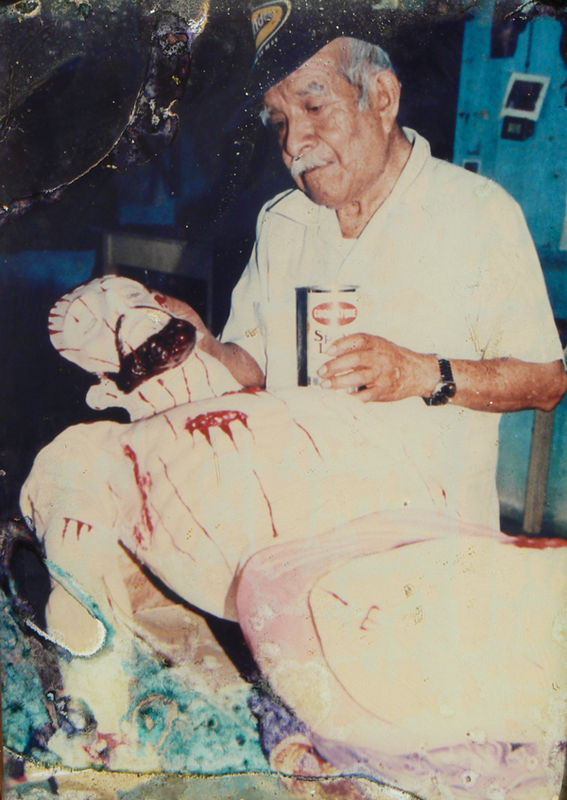 When Benito taught his daughter Alina to carve masks, he gave her the carving tools that had belonged to her grandfather—José Juárez García. 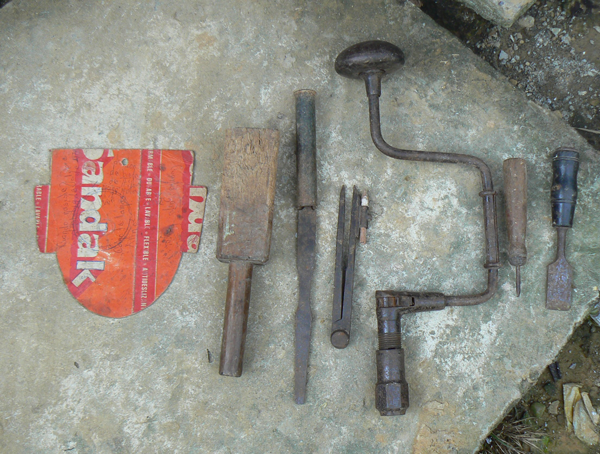 From right to left, we see a chisel, a scriber, a hand brace without a bit, a compass, a gouge (hollowing chisel), a mallet to strike the chisel and gouge, and a cardboard pattern that Benito made for Alina, to trace the outline of a “blank.” A blank is a block of wood that has been carved to a standard shape, then the features of the face are carved and the back is hollowed. All of these photos are shown courtesy of Alina Juárez Pérez, Benito’s daughter. 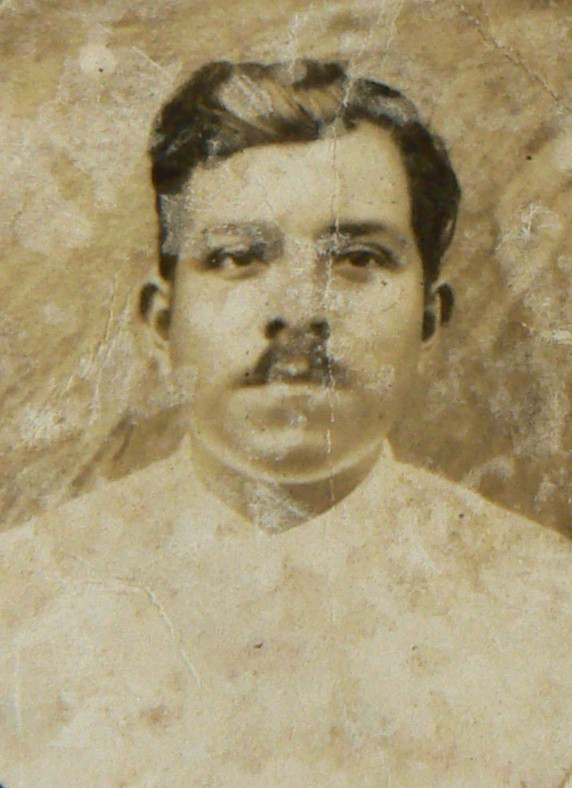 Alina’s Great Grandfather was José Juárez. 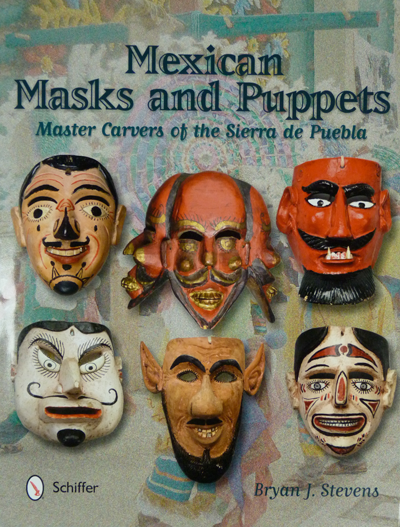 In future posts I will show masks by Alina, José Juárez García, and José Juárez. For the rest of this post I will display additional Huehue masks by Benito Juárez Figueroa that were carved later in his career (circa 1960)—first a Perro (dog), and then a male and female pair that have a different ear design from those that you have already seen, a design that represents a refined version of the ear design that had been used by Benito’s father. Here is the Perro, or dog. The ears were carved separately and attached by nails. 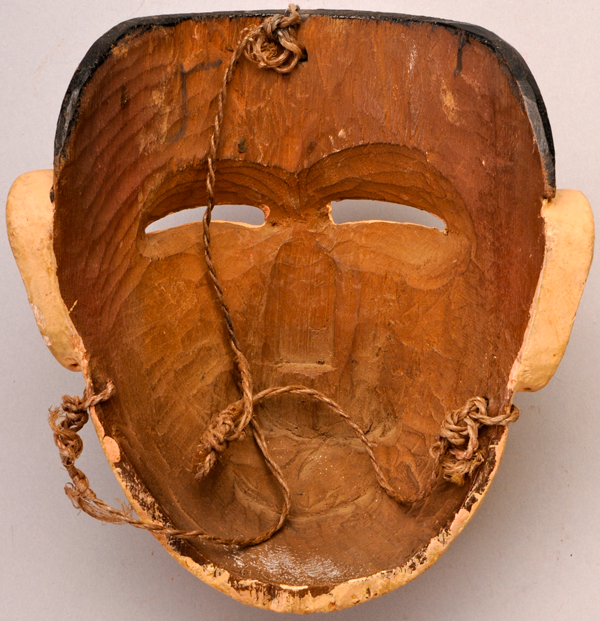 Here is the back of the Perro mask, which displays differential staining. 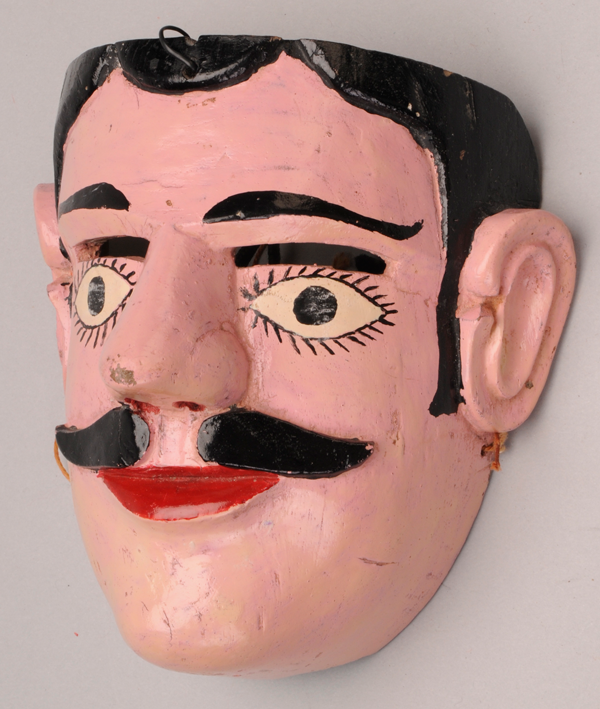 Here is an example of the male Huehue or Tejonero masks that were carved by Benito in his later years. In Benito’s later ear design, the shape of the ear resembles an oval racetrack, but on the front edge there is an opening framed by swollen ends. The lower end is faceted, almost like a pyramid. 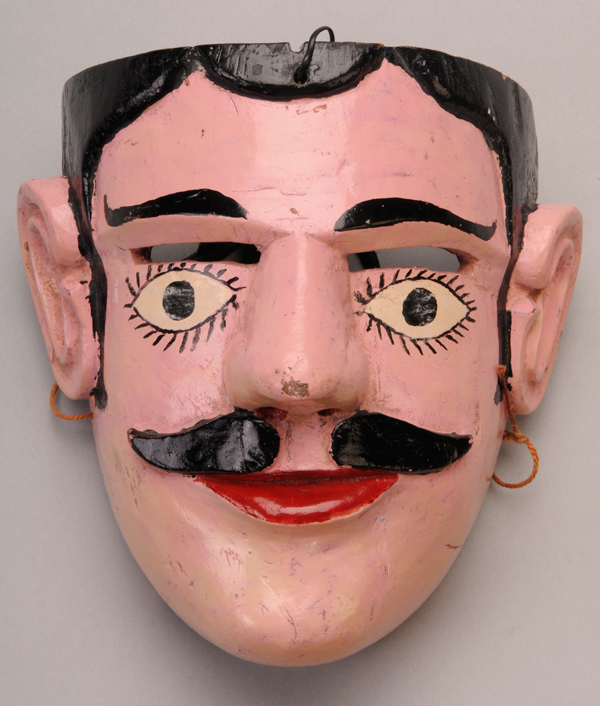 By this period mustaches were in fashion on Huehue masks, and this mask was originally carved with the two mustache segments in place. Benito favored this hairstyle for male masks—with a loop of hair over the forehead and short sideburns, all carved in relief. The sideburns end just above the opening on the front edge of the ear, and someone has painted a long extension. 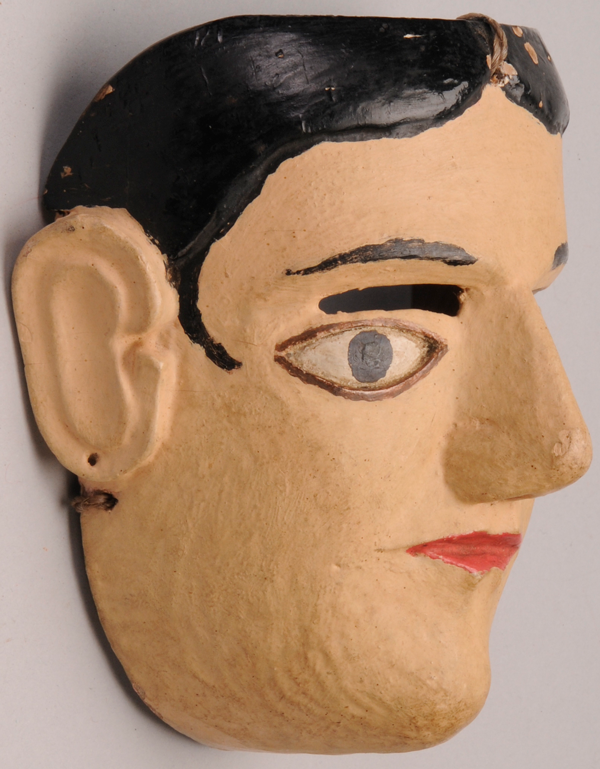 Ironically, although the painted extension of the left sideburn obscures the end of the relief carving, one can clearly see the end of the carved sideburn on the right side, in profile, next to the edge of the vision slit on that side. 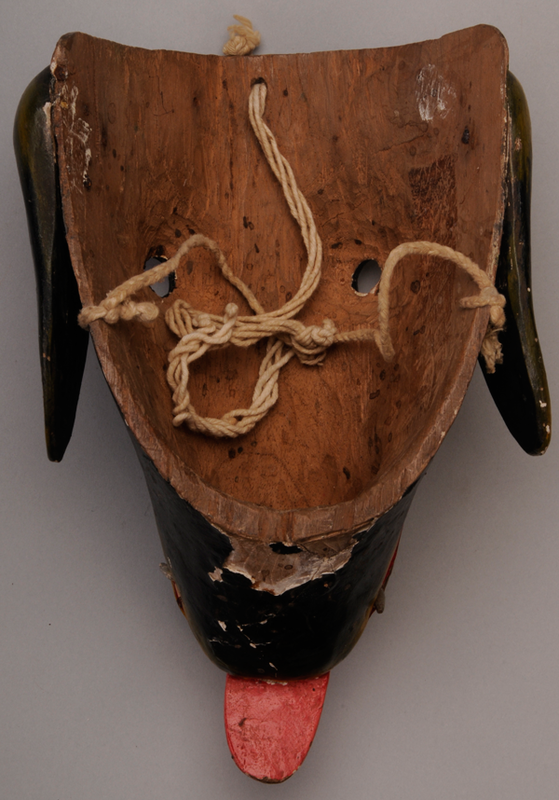 The back of this mask demonstrates familiar elements from the older masks, but more informally carved. The shelf at mouth level is more easily seen on this mask. The differential staining on this mask is subtle, with very dark patina across the forehead and along the sides. 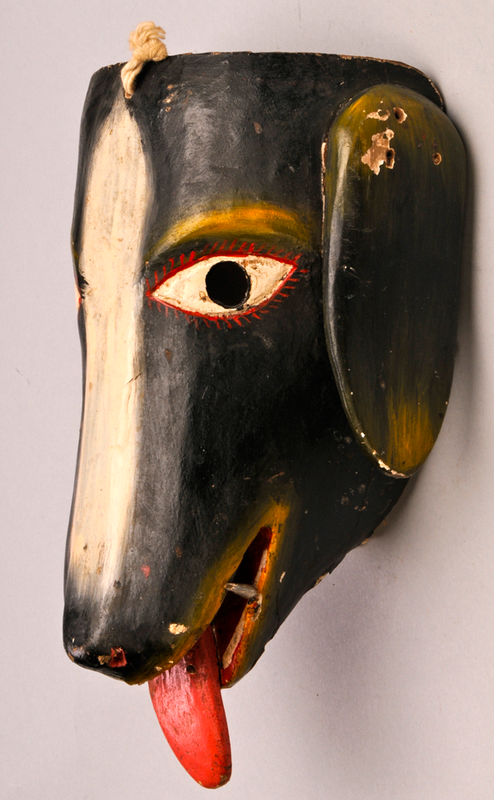 On this female Huehue mask one sees the same ear design, but this mask has relief-carved eyes, while those on the male mask were painted but not carved. This mask demonstrates again the typical female hairline of this region, augmented by painted curls. From the side, the female hairline and the ear design can be clearly seen. As on the male mask, the back of this mask resembles the backs of Benito’s earlier masks. The differential staining is fairly obvious on this mask. In summary, when one examines the style of a master carver over his lifetime, some things change while others tend to stay the same. Next week I will introduce the Huehue puppets and their setting—the telón, or curtain, along with other elements of the Dance of the Tejoneros or Huehues.